» When you unplug your USB Mouse from your PC, Windows resumes? When you unplug your USB Mouse from your PC, Windows resumes? Windows Vista, by default, goes into sleep mode instead of powering off. A nice functionality, sometimes I don’t reboot my PC for weeks. 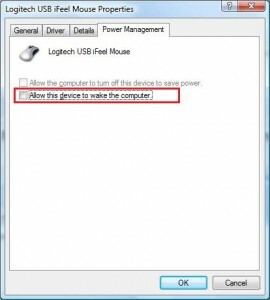 Then open to device manager, go to the device you think is causing the wake up (my mouse in this example), double click it and choose power management. This entry was published on Wednesday, January 21st, 2009 at 22:26	and is categorized under Uncategorized. You can follow any responses to this entry through the magic of RSS 2.0. You can also leave a response, or trackback from your own site. Thanks for that! Worked on Windows 7 as well! Wow Pieter, dude thank you! This has been bothering me for years, to the point where I was actually physically stressed every time I “turned the pc off”…and heaven forbid I forgot to unplug the mouse first. Seriously though, how is/was the feature EVER useful?! Thank you, really. I never bothered to look it up until tonight, I figured it wa some freak thing with MY computer only. Who knew google searching would bring me here.